#Brelotrial 49 of the shell casings recovered at the scene came from Brelo's gun. #Brelotrial Bell says Brelo says nothing about being on the hood of Russell's car. Brelo is "claiming amnesia", according to Bell. #Brelotrial Bell says they will show the court the video of Brelo's interview with BCI Investigators. During the interview. he says Brelo "attempts to cover up" his final actions where he shot from the trunk of the zone car and the hood of the Malibu. #Brelotrial Bell says Brelo jumped up on the hood of the Russell's car and fired the final, fatal shots to make sure Russell and Williams were dead. Cuyahoga County Prosecutor Rick Bell will now take over as prosecutors continue their opening statements. Bell says November 29, 2012 was a "disgraceful" day for the City of Cleveland. #Brelotrial East Cleveland police officers initially took over the investigation. The officers who fired shots sat together and were not initially questioned. BCI investigators arrived at 3:15 a.m. to take control of the crime scene. 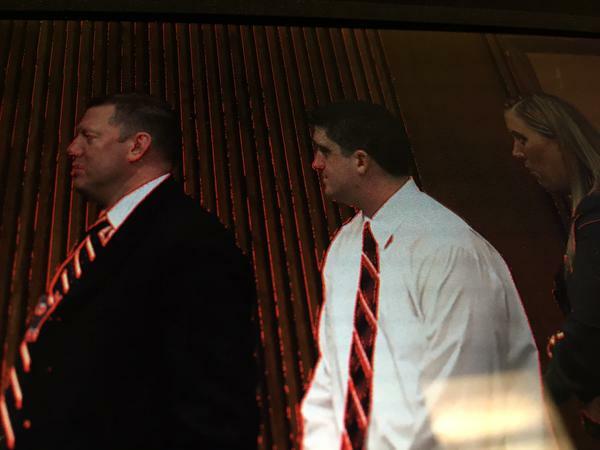 #Brelotrial Barnhill is listing each of the 13 officers who fired during the shooting and how many shots they fired. To explain the shooting, she is showing Cuyahoga Judge John P. O'Donnell a model of where each car was located during the incident. Brelo's partner fired 19 shots from inside and next to Zone Car 217. Brelo fired at least 49 times. #Brelotrial Barnhill says they know from the shell casings how many shots were fired and which officers fired shots. #Brelotrial Barnhill says Russell had "no escape" when he pulled into the Heritage Middle School parking lot. Officer Wilfredo Diaz fired the first four shots. No shot was ever fired from inside from Russell's Malibu. Shots that were believed to be from the Malibu were actually shots from other officers. CPD policy is that only 2 zone cars may get involved in the case. Barnhill says that was "ignored" as zone cars continued to join in the chase. #Brelotrial Prosecutors now showing the AVL data from zone cars the night of the chase. Prosecutors are showing the route of the chase. It started in downtown Cleveland and ended up in the parking lot of Heritage Middle School in East Cleveland. More than 60 police cars joined the pursuit, according Cuyahoga Co. prosecutor Erica Barnhill. Brelo and his partner, Cynthia Moore, were in zone car 217 that night. Cuyahoga County Prosecutor Erica Barnhill is now speaking. She is giving information about the timeline of events the night of the November 2012 police chase and shooting. Judge O'Donnell is taking a brief break. Prosecutors will finish their opening statements after the break. Prosecutor Rick Bell beginning opening statements. Michael Brelo trial about to start. Packed courtroom.